Online registration for the Horizons at Norwood 5K & Fun Run is now closed. We will be accepting walk-up registrations at packet pickup at Norwood on Friday, October 19, and on race day, starting at 7:45 am. Please bring cash or a check made out to Horizons Greater Washington for race day registrations. The Horizons at Norwood 5K is a professionally timed race that starts and ends on the campus of Norwood School in Bethesda, Maryland. The course winds through a beautiful residential neighborhood. Prizes will be awarded to the top three male and female 5K finishers. The largest and fastest teams will also be recognized. Teams can include participants in both the 5K and the Fun Run. The one-mile Fun Run takes place entirely on Norwood's campus. Runners and walkers are welcome in both events. All proceeds from the 5K & Fun Run support Horizons Greater Washington, a transformative educational enrichment program that serves low-income public-school students in Washington, DC and Montgomery County, MD by building partnerships between public and independent schools. Now in its fourth year, the Horizons at Norwood 5K & Fun Run has raised more than $92,000 to fund intensive summer and school-year Saturday academic, cultural, and recreational enrichment programs at Maret School, Norwood School, and St. Patrick's Episcopal Day School. The Horizons at Norwood 5K begins on the Norwood School campus, continues down River Road in the direction of Potomac Village, loops around Harrington Drive, Inglewood Court, and Inglewood Drive, and returns to Norwood along River Road. Police officers will be stationed at major intersections. The one-mile Fun Run takes place entirely on campus. Runners start in the Lower School circle and head down Owen Drive toward River Road. The route cuts through the small parking lot near the end of Owen Drive, continues across the bottom of the playing fields, and returns to pavement at the Middle School entrance to Norwood. Runners continue up the driveway, through the Middle School parking lot, and down past the baseball field, where they make a left onto the sidewalk along Bradley Boulevard. The last leg of the route proceeds up the school driveway and finishes with a counter-clockwise jog around the Lower School circle to the finish. Registration for the 5K is available at the Early Bird rate of $35 through Friday, September 14. After September 14, the 5K registration fee will be $40. Both rates include a high-performance t-shirt. Register by Sunday, September 30, to be guaranteed a t-shirt in your preferred size. Registration for the Fun Run is $10 without a t-shirt and $25 with a t-shirt. Can't make it to the race? You can still support Horizons by registering to Snooze for the Cause! Packet pick-up will take place at Norwood on Friday, October 19, and on race day. Details will be emailed to registrants. 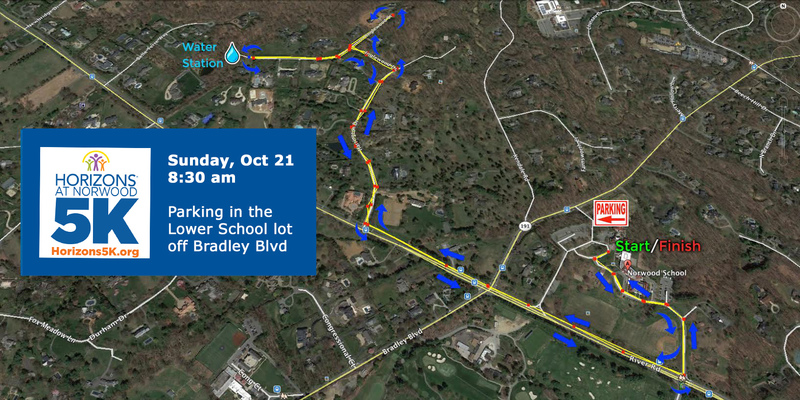 Parking is available in the Lower School lot at Norwood. Access will be via the Bradley Boulevard entrance only. This entrance will be closed at 8:45 am. Between 8:45 am and 9:30 am, there will be no vehicular access to the school. After 9:30 am, cars will be able to exit the campus via the Lower School entrance on River Road (Owen Drive), which is just east of the Bradley/River intersection. For safety reasons, pets, strollers, and headphones are not permitted on the course. Rain or shine, the race is on! In the event of extreme weather, all activities will be cancelled. All fees are nontransferable and nonrefundable, including in the event of cancellation. I understand that participating in this event is potentially hazardous and that I should not enter and participate unless I am medically able and properly trained. In consideration of the acceptance of this entry, I assume full and complete responsibility for any injury or accident that may occur while I am traveling to or from the event, during the event, or while I am on the premises of the event. I also am aware of and assume all risks associated with participating in this event, including but not limited to falls, contact with other participants, and effects of weather, traffic, and conditions of the road. I, for myself and my heirs and executors, hereby waive, release, and forever discharge the event organizers, sponsors, promoters, Norwood School, Horizons Greater Washington, and each of their agents, representatives, successors, and assigns, and all other persons associated with the event, for all of my liabilities, claims, actions, or damges that I may have against them arising out of or in any way connected with my participation in the event. I understand that this waiver includes any claims, whether caused by negligence, the action or inaction of any of the above parties, or otherwise. PHOTOGRAPHY: I agree to the use of photographs, audio, and video recordings of my likeness, voice, testimonial statement, if any, and to the use of my name, title, city, and state of residence in connection with my participation in broadcasts, newspapers, brochures, social media, and other media without compensation. I hereby grant full permission to any and all of the above parties to use any photographs, videotapes, motion pictures, website images, recordings, or any other record of this event.